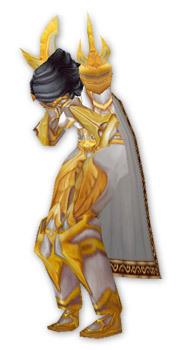 And now for the million dollar question: when was the last time you saw a paladin who was oom? I know these changes are coming, but like the proverbial turkey I’ve been keeping my head stuck in the sand trying to ignore it. A new healing phase is coming and we may very well feel a tighter pinch than we think. Remember when Illumination was 100%? Yea, it sucked when they changed it to 60%. This nerf is going to hurt, not only are we going to be less effective but the way we have gem/chanted/ and even chose gear has changed. You hit the nail on the hammer which I do not think most people realize which is the difference between the mana regen mechanics of illumination and mp5. Illumination scales with more healing output, making it fluid and dynamic in relation to the amount of healing required while Mp5 is static and receives more benefit from a fight with steady incoming damage. Although, like I commented in your more recent post about the “new” holy paladin spec, these changes sync well with the new build and allow for mp5 to be more useful in our style of healing. Orcstar, I am given to understand that Pallies doing hard mode encounters do go OOM. On normal modes NO healers are going OOM (shammies may be an exception to this but they are getting buffed hard in 3.2). Certainly, my limited experience of 10 man hard modes (2 healing) shows that mana management becomes a significant issue in those fights. What I don’t understand is the motivation behind these changes. Gutting HL and pushing FoL doesn’t suddenly make FoL viable. It STILL doesn’t heal anything like enough to even cover raid damage. We’re being pushed out of the tank healing niche (or our ability to perform in that niche is being strongly nerfed while other classes – druids and shammies – are having their single target healing buffed) yet we still don’t have the tools to raid heal / heal on the move. I’ll probably post on something similar to this – I did a breakdown of my regen on my guild forums not long ago. One thing that I do notice immediately about the above parses is that Siha isn’t meleeing for mana that often (this could be because of the particularly fights of course). Its incredible the amount of mana that this regens (hint situationally its more than replenishment!). i’m really glad you’re posting again! i missed you so much that i’ve come out of constant lurking to say so. This post in particular sums up what is helpful and necessary to me about your insights. You have a way of explaining things that doesn’t oversimplify or overcomplicate matters. You don’t treat your readers like morons or post in a way that is impossibly mathy. i was so pleased to see your post that i forgot to weep about the changes. Thanks! I will get up my WWS on wed, and pop up some stats about bubbles, crit and MP5 sometime after that. And silk – you are spot on there, I often meleed for mana in TBC (was a big advocate of holy pallies getting down and dirty), but in 3.1 I really haven’t needed to, which is perhaps why it wasn’t factored into Siha’s numbers. Ranged judgements FTW! But hard modes, not so much oom as using all the tricks to NOT go oom. We will be tackling Thorim hard mode this week, I will see how we go there with mana. I am ret in hodir hardmode as Pallies really are the last healing class you want to take in there, so that will be no help! I predict more bubble for pallies in future, BTW to deal with “healing” on the move. although my healadin has a way to go in gearing up, I’m really quite worried about the impact on pally healing: the mana regen dynamic will not match the way we spend mana on heals: and if we do not spend mana on HL heals, then the tank dies – the HL spam is sometimes a waste, but you can’t not cast it, in case the tank doesn’t dodge/mitigate. The end result? fewer paladins in raids: we can’t AOE heal, we can’t heal on the run, we have no automated heals. Now we will be OOM, and thus effectively useless. Why not take a drood instead? Or a priest? Much more value for money. What really concerns me, is that most of my gear, if not all, has crit, haste, and spellpower. I literally have 47mp5. I’m afraid I’m going to be so stripped come 3.2 I won’t be able to raid with my guild competitively. I don’t want to be the healer they carry because I’m oom and can’t sustain. But I think it’s unfair of blizzard to allow us to be ok without mp5 and then decide we need to focus on it, after two tiers of raiding. Do we honestly need to have an intellect nerf, an illumination nerf, AND the replenishment nerf?? The spirit regen nerf doesn’t even compare. I feel as if they equate not running oom as making fights easier, and if they think the only way they can make encounters hard enough is to continuously place restrictions on healers, then maybe they should take another look at their fights. We’ve been allowed to be this way for so long, and suddenly we’re the problem? It’s infuriating.